Jiro Kimura, who has now owned and operated The Gumshoe Site for 11 years, reports that legal-thriller writer Lelia Kelly lost a long battle with breast cancer on March 13th. She was only 48. In her first appearance, Presumption of Guilt, Laura Chastain is a senior associate at a prestigious Atlanta law firm, but when the situation arises, she is surprised to discover she is good at criminal defense work, which is far from being a specialty of the firm. In Officer of the Court, according to one reviewer on Amazon.com: �Lelia Kelly’s heroine once more surprises the reader by not following any pre-established rules of the game as a prosecutor. Kelly presents the interesting point of view, of what a prosecutor faces, when he/she knows the person on trial is really innocent of the crime. Chastain follows her own moral code, and not necessarily what the law, or the pattern of activities we have allowed to surround the law, dictates.� As of this date, all six reviewers on Amazon have given the book the maximum five stars out of five. A fourth book was promised, but in a letter she posted on her website in October 2002, Ms. Kelly saddened her readers by saying that her cancer had returned. There would be a wait, she said, before Laura�s next case could be told. Sadly, it appears that the next chapter was not to be. To the family and friends of Ms Kelly, we all leave our prayers. As a new reader of Ms Kelly’s, I loved the Laura Chastian series. I am sad to hear of her passing … wish all of her family — our deepest sympathy. I recently discovered Lelia Kelly’s books and was looking forward to finding more. I wish her family well. We lost a truly enjoyable author. 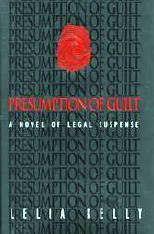 Having just completed ” Presumption of Guilt” I came to my PC to find out more about this enjoyable author.. I am saddened to discover that she has passed from this life.. I will find and read her 2 other published works..
My best to those she left behind.. Looking through a bookcase this morning, I found my 3 Lelia Kelly books, and wanting to know if she had written any more Laura Chastain mysteries, googled her. I was saddened and surprised to find she had died. My sympathy to her family and friends. Readers have lost a wonderful voice in mystery. I love Lelia Kelly’s books and I look every few months for a new one and just ran across this sad information. She was so talented. Such a loss at such a young age. From someone who just lost a 21 year old son a few short weeks ago I know how this must be on the family. My condolences to all. Found Presumption of Guilt, among my books. The story was so amazing. Turns and twists along the way. I, too came looking for more Lelia Kelly novels. I am saddened that this talented, beautiful lady lost her life so soon. Heaven sure is blessed with talent galore. I am really sad to find that Lelia passed away. Her books were one of my favorite series. I finally googled her and it led me to this site. Best wishes to the family even though I am 6 years late! I just finished my 3rd book in the Laura Chastain series, “Officer of the Court”. I came my PC to find others since I saw that one was promised in the back cover. I was deeply saddened to see that she passed in 2007 at such a young age. My deep sympathy goes out to her family. I thoroughly enjoyed her books!!! I, too, am saddened to know of Ms Kelly’s passing. I just recently read her, “Officer of the Court”. I was looking forward to reading more of her books. She provided very good reading! I just finished reading “False Witness” and loved it. I checked to see what other books Lelia had written and was sad to find that she had passed. Condolences to her family even though quite late. I truly enjoyed Laura Chastain and was looking forward to more. I’m currently reading False Witness & enjoying it a great deal. I googled Lelia Kelly, who I had not previously heard of, only to find she has passed. What a shame. She was a talented author with a career that was short lived. As others before me, I found great pleasure in reading my first introduction to Laura Chastain (“Officer of the Court”) and was looking forward to more from Lelia Kelly. Her untimely passing is a loss for mystery readers and more so for her family. Her talent will permit her to live on for many years beyond her time, as one remains among us so long as one is remembered! Like the readers above, I too have ached to read the fourth installment in the Laura Chastain series. I had read the other three about ten years ago and enjoyed them immensely . I recently read them all again with much enjoyment. this time , I logged on to my computer to find out what happened to book number 4 . Here I sit, feeling so sad upon learning of Leila’s passing . God bless you , Ms. Kelly, and thank you for the hours of pleasure you have given me .